I grew up in the Princeton area of central New Jersey. But my story is a lot different than “The Sopranos” or “Jersey Shore.” Some of my ancestors were among the earliest English settlers in the region. My parents were florists of notable reputation. I began playing violin at age 8. I went to Boston University where I earned a Bachelor of Music degree in Violin Performance. Several years later I switched my specialization to viola and earned an Artist’s Diploma in Viola from the Cleveland Institute of Music. Early in my career I was a member of the USAF Strolling Strings based in Washington, DC. I entertained at the White House, State Department and Chief of Staff residences and toured worldwide. 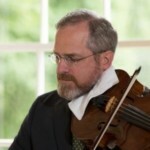 I have held front desk positions with the Knoxville Symphony, Sacramento Symphony, and was Principal Viola of the Hamilton Philharmonic of Ontario. I have subbed with various orchestras including the National Arts Centre Orchestra of Ottawa, Ontario, the Chautauqua Symphony and the Pittsburgh Symphony. I am now a member of the ProMusica Chamber Orchestra. And I am concurrently Assistant Principal Viola of the Columbus Symphony, a position I has held since 1991. I am a published composer with works in the catalogs of Oxford University Press, Berben and Watchfire Music. I am an avid cyclist. My wife and I are certified foster parents for the State of Ohio. I believe it highly important to teach not just the instrument, but also the historical and theoretical concepts in which the music emerged. It is my goal to produce thinking musicians with the ability to solve musical problems in an intelligent, informed manner.